Here we are at the Christmas tree farm. We cheated- we went to the farm to take pictures and smell the trees, but in 90 degree heat chopping down a tree and paying a premium price for it just wasn't sounding too attractive. So we opting for the cheaper tree at Home Depot! Sorry Pellisier farms, we used you for your ambiance! When we got home, we set up the tree and unfolded all the ornaments we've (or shall I say "I") been saving for years. Seriously, i'm like the biggest pack rat. My mom found a whole box of ornaments I got on a 75% off sale at Target 8 years ago (no joke, they've been sitting in cupboard for 8 years). Grandma Cook also gave us her reject ornaments (which, proved to be a bit hit and miss...the clown ornament scared the living day lights out of me for obvious reasons). We also found a SWEET nativity set on our honeymoon in Mexico. Now being a bit of a bargain hunter, I was over the moon discovering that the set was on sale. However, 4 months later when setting it up in our new place, I was reminded of the little fact sale items are often defective. Case in point...A NATIVITY SET WITH NO MARY AND JOSEPH!!!! Unthinkable right? Well, being the resourceful woman that I am, I borrowed an extra Angel to play Mary, and i'm pretty sure our new Joseph is a middle-aged Shepherd with white hair. But needless to say, it's still beautiful! So, as Kevin and I were decorating our house for Christmas, our 7 year old neighbor Kasey came by. 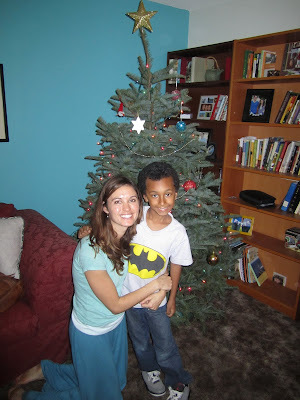 His eyes lit up when he saw our tree- excitedly asking if he could help us decorate. With a smile, I handed him an ornament, and soon Kevin was hoisting him up so that he could top our tree with our golden sparkling star. With two feet back on the ground, Kev asked Kasey if he knew why we put a star on the top of our tree. Kasey shook his head no. The magic of the Christmas story danced off Kevin’s lips, but Kasey crinkled up his nose, quizzical. Finished, Kev asked Kasey if he knew Jesus. “Does he live in New Jersey?” a small child’s voice responded. “No Kasey, Jesus lives in heaven with God, but we celebrate Christmas because it was a time when Jesus came to earth to teach us how to live and love, and how to start a relationship with him. He loves you Kasey”. And this is why Kevin and I feel called to be missionaries in our own neighborhood. Because the love of Christ is available to all, but there are so many who have never heard His name. Some who might think Jesus is a man that lives in New Jersey. Kevin and I did not move to Topaz Lane because it was a great complex, prime real estate, “safe” neighborhood or because it had a great school district. We moved to Topaz to dig deeper with our neighbors, to love them and be loved by them, and to share the beauty of our Savior’s unconditional love. 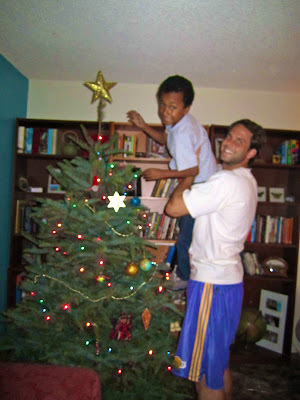 Every day for the last 2 weeks (since we put up our tree) Kasey, and his younger brother JT come and play at our house. We play cards, and share stories, and hug them, and laugh. One day Kasey came over, and because I was working, he sat and played with our nativity for 30 minutes. Finished with work, I walked over and was able to mimic the Christmas story using the nativity set. I pointed out baby Jesus, Mary and Joseph, shepherds, the angels and 3 wise men. Yesterday when JT came over, Kasey held up baby Jesus and said "JT, this is baby Jesus, Katie told me so!" Christmas is SOOOo wonderful for so many reason, but this season I'm reminded that the GOOD news is really good news, and is worth talking about each and every day! This is such an incredibly beautiful example of how God can use us every single day. In the smallest ways, he can move so largely. Your example of love is inspiring. We too have young boys in our neighborhood that sometimes come over to play with our puppy. And not once have I ever talked to them about Jesus. WHY NOT!? This is so encouraging to me, reminds me the BOLDNESS we are called to walk in, the power of the Holy Spirit in us to step out and share the Truth of Christ with others in our daily life. THANK YOU. What a beautiful reminder. This is so so sweet! That is so awesome that y'all are being missionaries in your own home! SO Important! It's definitely our call as believers! Your home is precious!! I love the huge book shelf! I've been reminded, while in Moose Factory, that so many people come running to Jesus as adults because of memories of Him as a child, and seeds planted at a young age! Y'all are awesome!